Symborg’s subsidiary in Mexico is very active in communicating the benefits to agriculture of its mycorrhizal fungus, Glomus iranicum var. tenuihypharum. 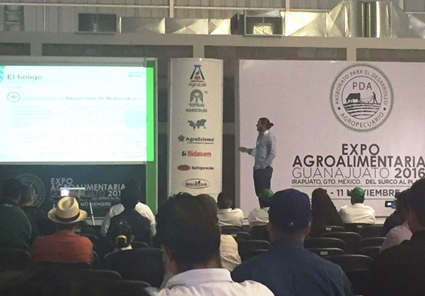 In November, the company was invited to offer two presentations: one of them at the Expo AgroAlimentaria in Guanajuato and the other at the 4th Symposium on Biotechnology Tools for Sustainable Agriculture, which took place in Michoacán. There were several conferences and presentations during Expo AgroAlimentaria on subjects related to modern agriculture. Symborg gave a public presentation on the use of microorganisms in intensive agriculture and more specifically on the case of Glomus iranicum var. tenuihypharum in the cultivation of berries. Leandro Jurado, Symborg Country Manager in Mexico, explained to a packed audience the importance of having a good root system for the proper vegetative development of the plant and how microorganisms can help to enhance root systems. He explained how Symborg’s products, based on the company’s patented mycorrhizal-forming fungus Glomus iranicum var. tenuihypharum are able to colonise plant root systems, promoting greater growth. Increased roots lead to greater efficiency in absorption of water and nutrients and therefore increases in crop yield and fruit quality. This results in production increases of from 10% to 15% in the case of berries and even higher in other types of crops. Symborg’s Director of Research and Development, Dr Félix Fernández, will give a scientific presentation on 2 December entitled, “Glomus iranicum var. tenuihypharum. An effective microorganism for intensive agriculture” at the 4th International Symposium on Biotechnology Tools for Sustainable Agriculture. This meeting will be held from 30 November to 2 December in the Auditorium of the Institute for Research in Ecosystems and Sustainability (IIES) of the Autonomous National University of Mexico, UNAM, in the city of Morelia, Michoacán. Dr Félix Fernández’s presentation will address the importance of arbuscular mycorrhizal fungi (AMF) for plant nutrition and the difficulty in applying them to real crops, maintaining the profitability levels demanded by modern agriculture. However, as Dr Fernández says, “this is something that is recognised and well known by the scientific community, but Glomus iranicum var. tenuihypharum is different because of its tolerance to pH (from 5 – 9.5), saline soils and also to high fertiliser concentrations. Furthermore, this species, patented by Symborg, can produce abundant extramatrical mycelia that enable good transport of nutrients toward the plant”.